Natalie Law and Damien D’Arcy, who only missed out by a few votes are still keen to be involved in supporting school life. One of the first steps we will take in the next few weeks is to arrange a weekly parent governor drop in as a support for parents, but also to grow our ‘parent voice’ in school. Again we would like to thank the parents for putting themselves forward for election and all the parents who voted. If you have any questions for any of our parent governors please fill in the contact form below and they will get back to you. We have been having fun playing a game of Pig with our readers. Mr Read was very confident that he would win but that was not to be the case! 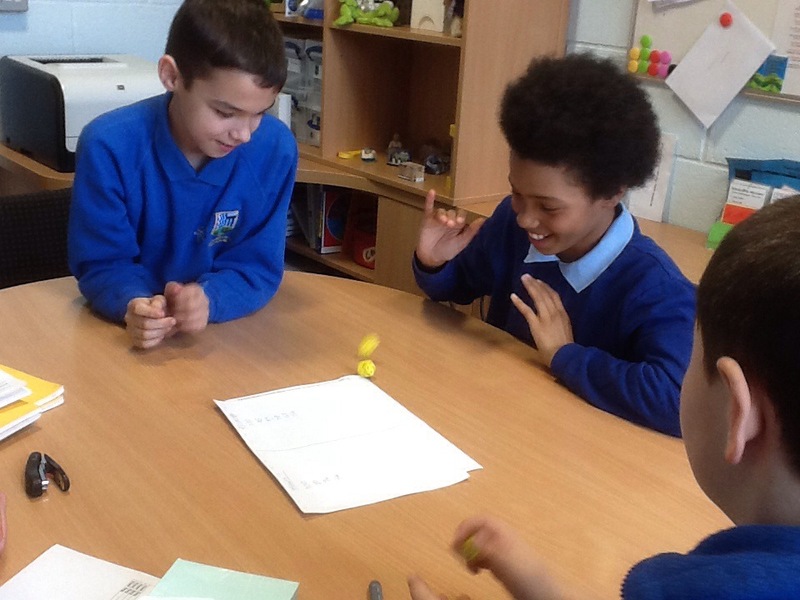 This is a great way to practise your maths skills…all you need is paper, pencil and 2 dice. You start at 100, roll the dice and either add or multiply the digits. You then decide to either bank your total and subtract it from your 100 or roll again and combine your score. The catch is if you roll a 6 you lose your score and your turn. Isaac, Jack and Jamie really enjoyed the game and improved their maths. This week Mr Read and I are very excited as we are off to Thornbridge with the Year 4 classes. Mr Read will be setting off on Monday morning with Mr French’s class. I am going on Wednesday with Mrs Rhodes and her class. Going away on residential is fantastic part of our job. Spending time with children in a relaxed and exciting atmosphere is the best way to make relationships deeper and find out what children really enjoy doing. It looks like the sun is going to shine on us as well. Look in the Green Un next week for a full report on activities. To celebrate World Book Day and the love of reading this afternoon every adult and child in school had a Cosy Read session. Children were mixed up from right across school as they chose the book they wanted to go and listen to. 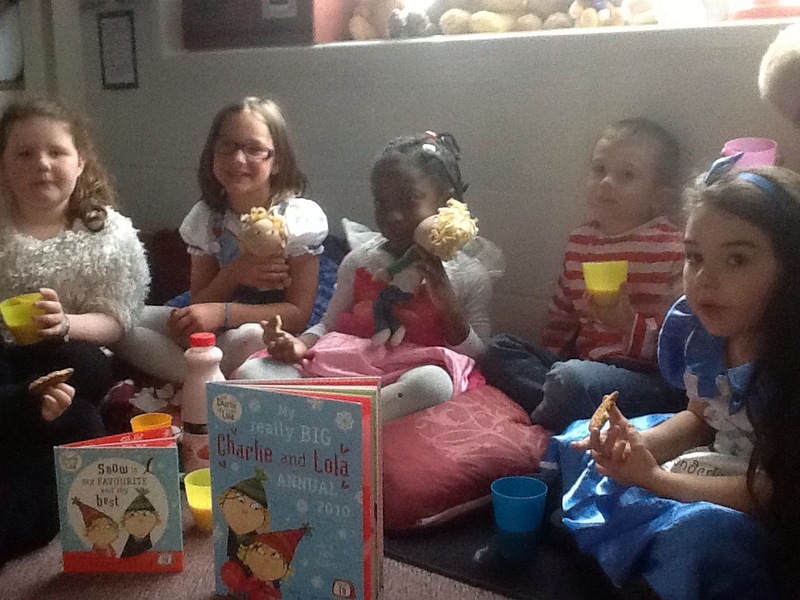 I had a lovely group of children and we read Charlie and Lola books and shared Pink Milk and cookies. Look out for your Book Token tomorrow. I would like to say a big thank you to Miss Heap for organising the afternoon. We would like to tell about an improved appointment system we are introducing to enable you to see your child’s class teacher. As you know we have always had an open door policy at WCM and we would never want to change this, however we want to establish a more efficient way of dealing with any issues rather than trying to do it informally at the start of the day when teachers are at their busiest. The time when the doors are open in the morning should only be used to pass on facts to teachers not to discuss problems or issues. This will leave the teacher free to help settle in children, move around the classroom to interact with children and for you as parents to get your child ready for learning. This time in the morning is often very busy and the teacher cannot give you their full attention, conversations are not private and sensitive information may not remain confidential. Some parents may need to see teachers on a regular basis because their child has specific needs. This is fine but does mean that some parents never get the opportunity to talk to the teacher. It is also important that your child’s teacher is able to remain focussed on teaching children and if they are bombarded by several issues before the day has begun this becomes very difficult. We feel that by making slots available after school this will enable issues to be dealt with in a more efficient way. If you wish to make an appointment to see your child’s class teacher or a Learning Mentor please go to the office where time slots will be available for you to book. If you wish to see me or Mr Read about any issues then the office will also have our availability for appointments. We hope you understand the reasons behind these changes, our focus has got to be on teaching and learning and helping your child to have the best education possible.